Violet Abomination....I'm not familiar with that Chapter. Heheh. Violet Abomination is code name. But in general they are Hawk Lords. Here is link to Lexicanum with some info about chapter. This is regular part from plastic rhino kit for this top openning. 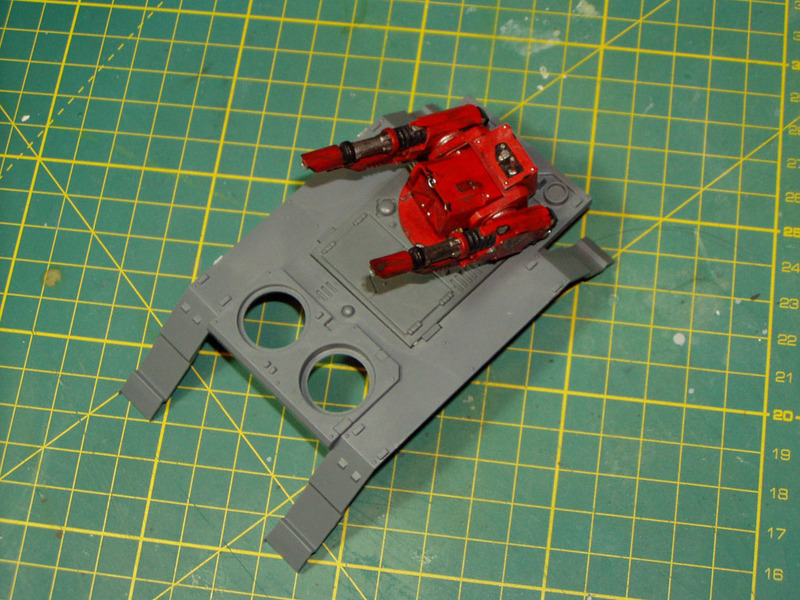 There are parts for doors on regular rhino and then part with details on bothsides used on razorback and from other side for predator or whirlwind. Look at photos. On the first photo are regular top doors and part with hole for turret from both sides. On the second photo you can see them on Rhino. 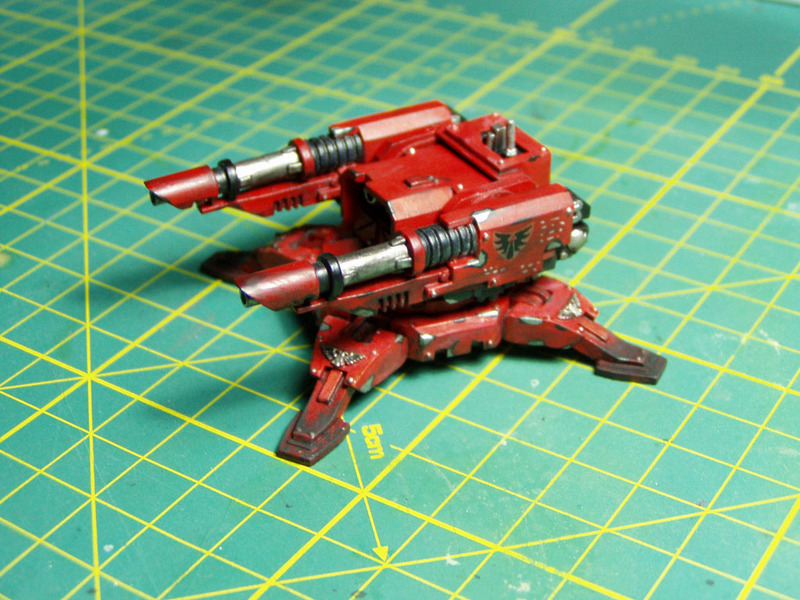 On the third photo is attached custom made tarantula turret based on FW design. 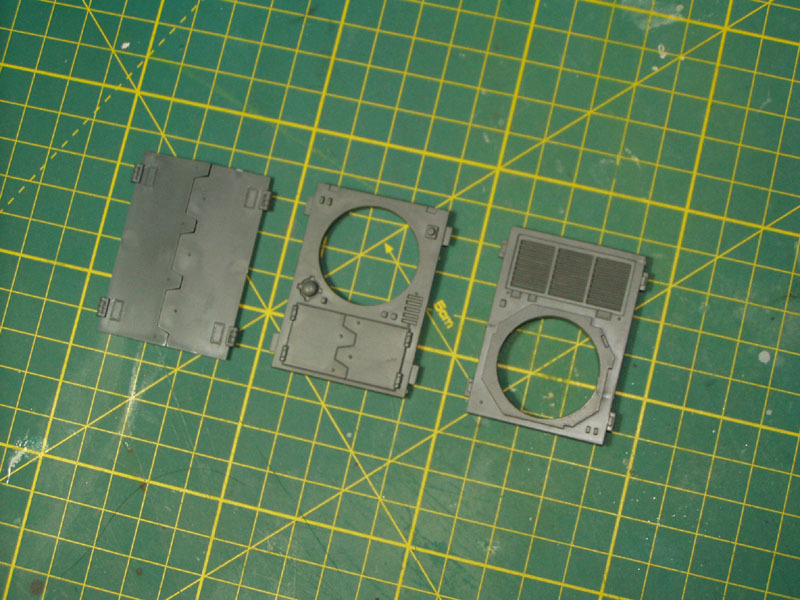 On the last photo you can see comparison between rhino parts, base from tarantula sentry and front part from Land Rider. And here is photo of whole Tarantula sentry with Twin Linked Laser Cannons, you will notice, that they are not same as these from FW. Btw UK-Blade, I hope you will like used color scheme on it. 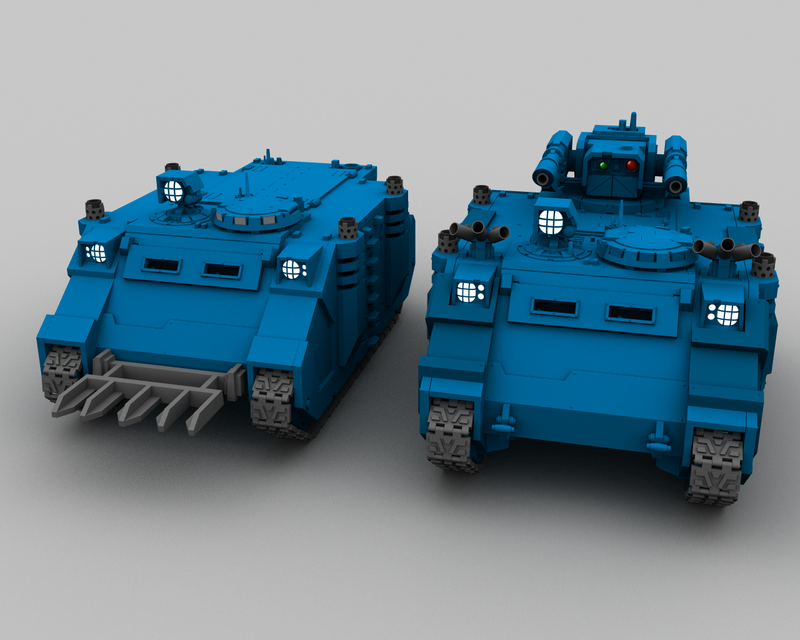 And here we have just finished renderings of Twin Linked Heavy Bolter tower on my 3D rhino Forgeworld style base on my master parts. Now in violet colors. 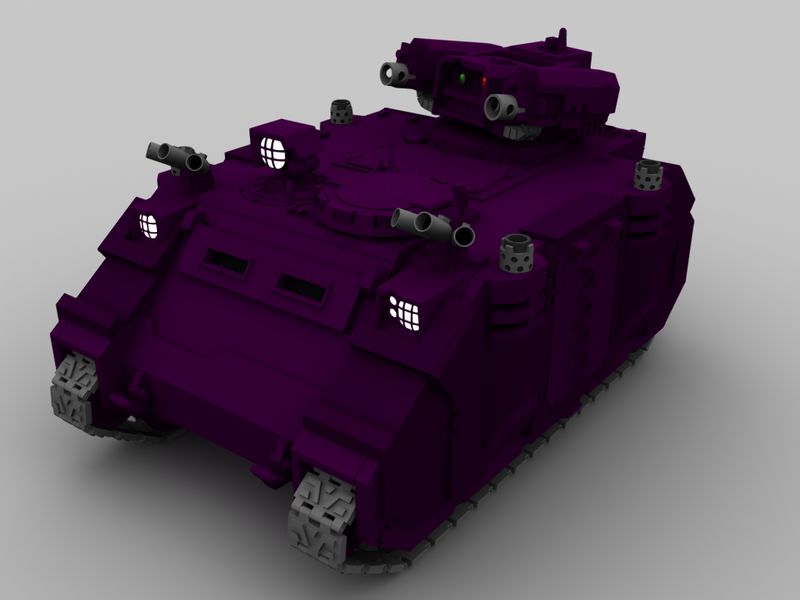 Actually doesn't look half-bad in purple, with some good contrasting colour, you've got something to cause confusion and shock in your enemy, possibly even fear. Thanks for opinion guys. I know that violet color is a bit brutal. But I donAât call them "Violet Abomination" for nothing. With gold details, beige scratches and dust, taktical markings it will look much better and try imagine face of opponent on table Then this color is not much common on tournaments. You canAât overlook them and this is why I choosed it. Slaaneshii marines tend to be purple, however. The first sign of Slaaneshi tendencies and its Exterminatus for everyone. It is funny to see, how you guys react to Purple color. 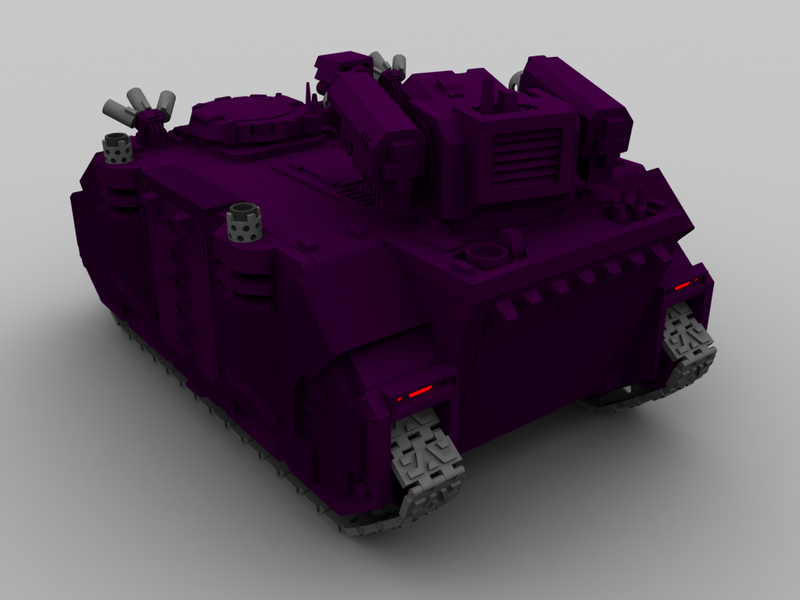 But I think more brutal will be pink, that is more slaanesh than violet. 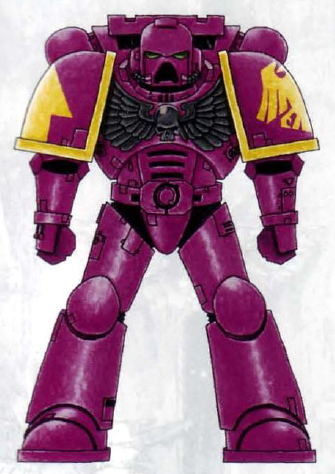 Here is official color scheme on Space marine. But it will look darker in real. I will see after paint tests, what final violet tone I use. I was thinking about something close to Dark Angles, but as violet. On Rhino I used a bit lighter color, to be visible something at least. But generaly renders will be not only violet or blue. Advantage of 3D to change paint scheme really quick than on real models. is that a pic you found? or did you use bolter & chainsword's model painter thing? Yeah I know that DA can be played as Chaos marines too. But they will have common only similar dark tone of color nothing else. This picture is probably from painter. I didnAât checked source. In book "How to paint space marines" is only diference with chest eagle, it should be silver. Here is picture from this book on Lexicanum. I will see, what I use. I will play them as codex chapter, then I think this doesnAât matter. Hm, I didnAât noticed, that I misspelled Angels as Angles. Hee hee hee; The Dark Angles and vs the Bright Saxons...? Hehe. May be. Btw when I builded meshes of these Tarantula Heavy Bolters I found that, these ammo feed belts on plastic model are bad and when you make them in 3D they will look strange, unrealistic and unfunctional. 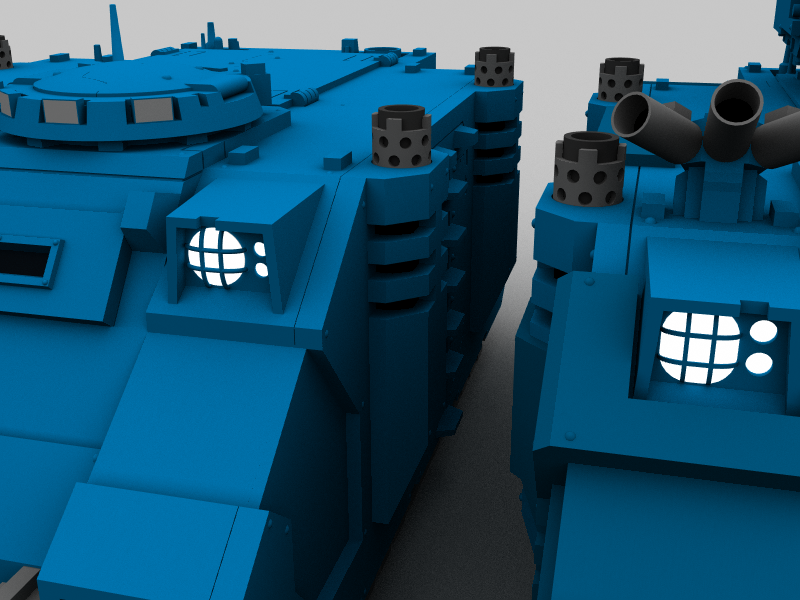 Much better looks this part on 3D video from Space marines game. As seen on attachments. 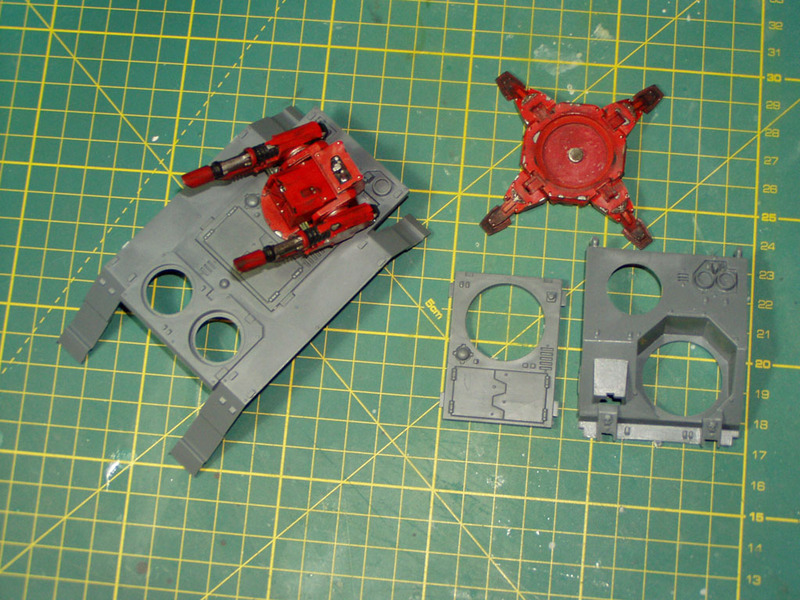 On photo is visible this part on forgeworld tarantula tower. For miniature there it is not problem, but for 3D model it looks really strange. Great work in this thread, love the attention to detail, can we see an interior shot? Hmmm the curve on the belt could a bit gentler for the FW model but actually I think the one in the pictures from the Space Marine game make even less sense. They seem to be meant as open belts with just the bullets going through them but then where's the difference between shell and slug? How is that structure held together in the first place? Feels very fake and non-functional. The FW model one actually tries to emulate an enclosed belt system with the bullets just not visible at all, which makes much more sense in terms of cleanliness and reliability. I always thought they were just all enclosed. But I suppose you just need to apply the ":cool: Rule of Cool :cool:"
IAâm not sure, if I have clear render of interior. In main cargo hold are missing monitors and controls inside near sliding doors to driver. Everything else in on place. I will probably finish these details. Driver cabin is now empty same as on plastic kit. IAâm just playing with threads to try put them on place, if there is enought place in wheel module above side entry. I know what you mean. But problem is that we donAât exactly know, if this belt is only cover for something inside (real ammo feeding belt as on real weapons same as on some of your photos) or these are independent cartridges with ammo. There is no real reference for this. I just checked DoW2 intro and even they use HB here. 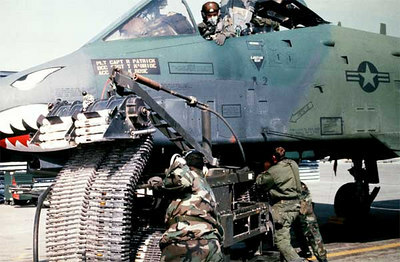 It is not visible, how it looks when it fires. It they are trays with projectiles or cartridges chained together. On this render from Space Marine it looks like these are two trays with limited movement and between them something that move projectiles to HB. From side isnAât enought space to flush something more than shell. Another thing is why they donAât use caseless rounds. I know it will not look that cool, when empty shells are falling on ground. Next thing is, that this FW model has a bit much wide barrel when you compare it, how big projectile you can get throught this ammo feed. This HB issue I will try solve next time. Here I have another thing to show. There is not exact explanation if main tracks can be in this side pylon. As seen on this render, they can be here. There are needed few minor modifications of inside of side hatches and main then choose position and size of tension wheels. But I think it can be done. Even on plastic model. Cool, It's a tight fit but looks like you could pull it off. 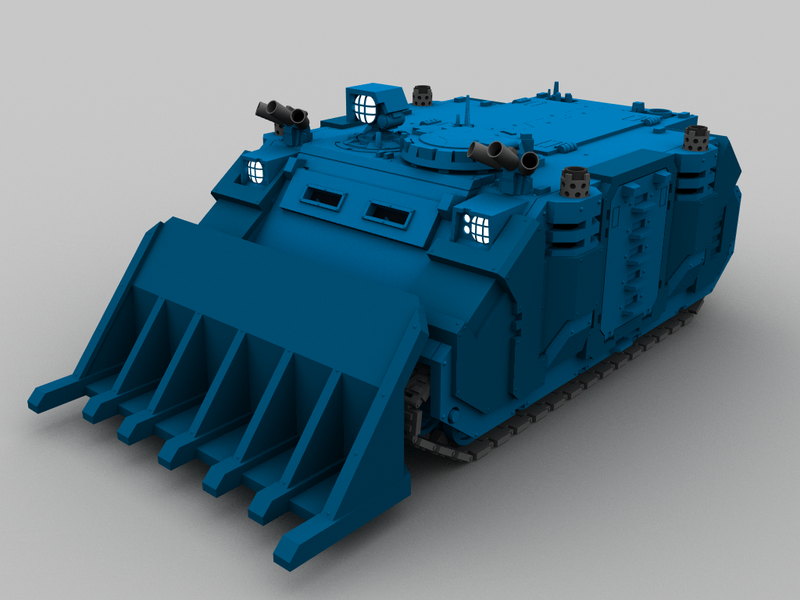 Here is render of few mods, that I did on basic rhino. There were changed shapes of main lights, include searchlight and hinges of this upper round hatch. They were a bit too high. New model is on left. Btw I found funny thing. There is no real rule for placing front lights. Even on official GW painted models. Difference between old version and newer is visible on next render. 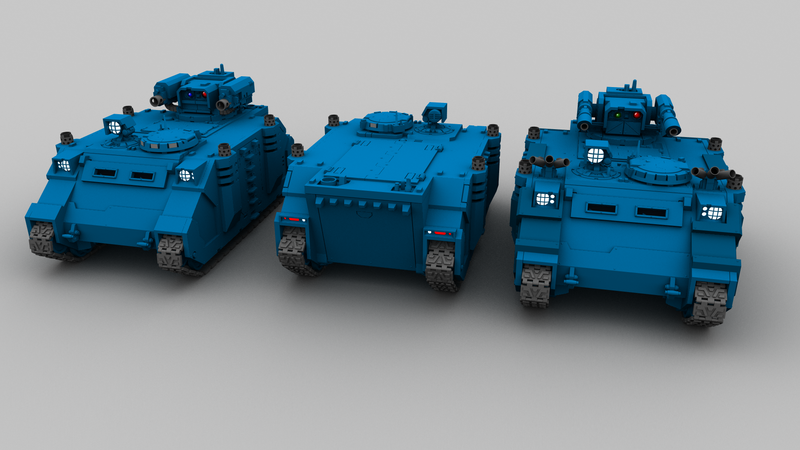 And here we have all three variants of rhino and razorback. These two on left are newer types. Yeah I will have some more types of rhinos. Include Helios, Hyperios, Damocles, Predator etc. These working tracks are primary for 3D model or for some diorama, where this can be visible. But you are right, IAâm thinking about RC version, but here I have to make different internals to have here enought space to put here everything needed. In this scale is problem create from plastic kit RC rhino with tracks same as they should be.